A baby deer is an awesome beast. Here is a good opportunity for their observation. 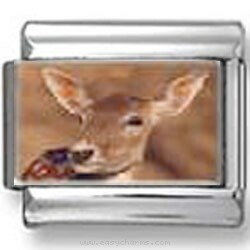 The charming real picture of baby deer is placed on a shimmering stainless steel backdrop under protective gauzy laminate. That gives you a perfect chance to enjoy a high-quality image added to your personal bracelet.